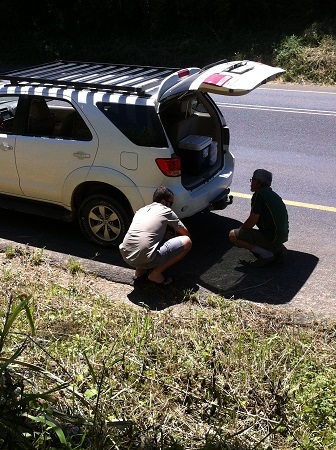 but then on our way from Yaounde, Cameroon, to Gamboula, we had a flat on our truck as well. Too bad that we were driving on very bumpy road and the air conditioner was making alot of noise so we didn’t notice it right away. That, my friends, was a brand new BF Goodrich – really! only 1 week’s use on the truck! We are thankful that the rim wasn’t damaged. We were blessed by a huge patch of shade; a mango tree planted in front of 2 huts out there in the boonies. A couple of guys pitched in to help Roy and provided a bench for me to sit on. 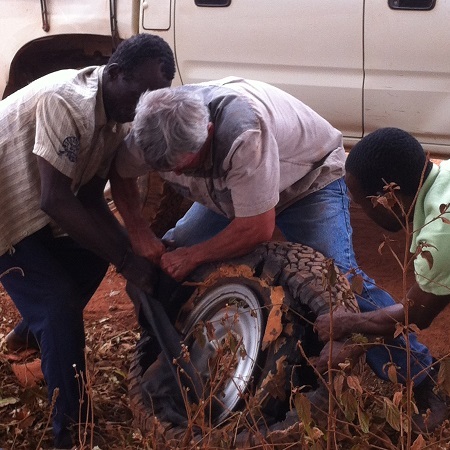 Roy gave the inner tube to the guys who helped him change the tire – here they are wrestling it out. 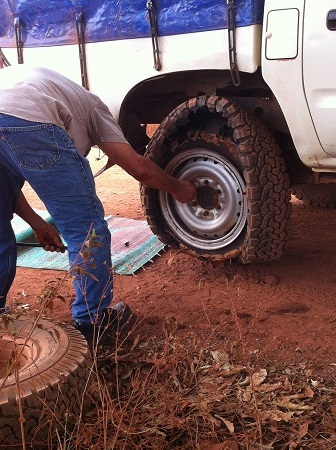 Okay, that’s enough flats for awhile – we put alot of miles on our truck and rarely have to change a tire. Thank you for your prayers for us as we travel, we know that we have been blessed for many, many years.